Hidden Forest is the second map that appears at the Shop in Interium. It will appear after you leave town and return, and won’t cost a hell of a lot of buy (I saw it on sale for 100 St and 150 St on two different occasions). - First up: monsters. They’re pretty much identical to the ones you’ll find in the Forest Ruins this early in the game, the main difference being that there are usually fewer of ‘em. 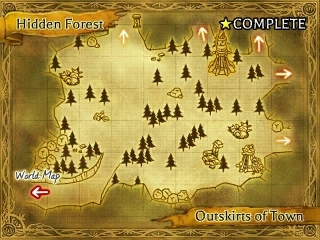 This makes the Hidden Forest a pretty good starter spot for exploration, levelling up stats and Skills, finding chests, and so forth. - Follow the main road. You may find a Sparkle on your left as the path widens into the forest. If you head east from the main road you can find a side path. Skirt along the southern edge of the map and wander back towards the road and you may find a Chest in the midst of a copse of trees. - There’s a large shell in the southeast of the map where you may find a Sparkle. East of here, to the very edge of the map, is an exit to… ‘Cat Territory’. Huh. North of here you’ll find a large, old fountain; activate it and we’ll have to learn about something new. Before we proceed any further we need to discuss that Singing Shard you found a while ago. The Shard is an equippable item, and using it in battle will allow a character to influence the flow of elementals in an area. Use the Singing Shard in battle near Initium and the elemental monitor on your screen will fill up with blue. This will give watery spells an advantage, and will restore a bit of your health each round. You’ll need to use contracts with elementals throughout the game to give yourself advantages… as well as to sap enemies of their advantages. Look on the lower screen and you’ll see the placement of yourself relative to your enemies. On the upper edge of this diagram you’ll see several icons, each relating to an element. That element is to the favour of whichever side of the diagram it’s on. If you want the advantage yourself, make sure you use some kind of Skill that will shift it over to your side. Letting the enemy hog all four elements is baaaaad. If you activate waypoints like the fountain, mentioned above, you can start battles with an elemental advantage so long as you are within its radius. The size of the radius varies from object to object. It is very, very important to note that you need to establish a contract with an elemental type before you try and use any magic associated with that element. If you don't have a contract, whether through using the Singing Shard in battle or other means, the spell will fail... but you'll still be out the SP cost. For this reason, it's usually wiser for faster characters to have spells, as there will be less of a chance that your foes will steal your contract with the elements away and ruin your spells. - Anyway! Besides the fountain there’s not a hell of a lot else to see on this map. There’s another conch shell in the northwest, a potential Sparkle in a grove to the southeast (north of the entrance), and three other potential exits. In the northwest is a large exit to Path to the Ruins I; in the northeast corner is a smaller exit to that same map, as well as another walkway into Cat Territory. 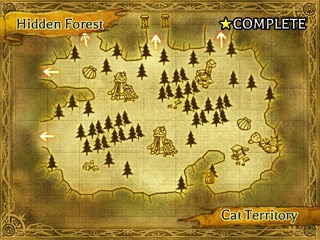 We’re going to start with Cat Territory, since it’s not that different from Outskirts of Town. - We’ll start from the lower entrance. Head southeast and you may find a Sparkle against a cluster of rubble. Further east is a ruined fountain; here, too, you may find a Sparkle. North of the fountain the path connects with the upper area, which we’ll explore in a bit, though if you look on the right side of this northward branch you may find yet another Sparkle. - In the southeast corner of the area you’ll find a small yellow pad that looks like a save point. The cat that saves your game will appear, and he’ll give you Mystic Honey. Woot. A short distance from this is a singing stone; interact with it for a Whispering Shard. Don't miss this. The Shards are some of the most important items in the game, and are necessary to proceed. This Shard will allow you to use the Water Shield charm, one of the most important charms in the game, as it will increase your defence so long as you have water elements on your side of a fight. - Head north. There are several shells hugging the eastern wall where you can find Sparkles. You can find a few more by traversing the north and completing the map as you head back west. There are three exits in the north; all three lead to East of the Ruins, which we’ll look at in the next article. Whoops. Thanks for pointing that and the other Stance out, I'd meant to get rid of those paragraphs. Guess I forgot. If you look at the Stance guide on this site I'm more aware of how random the Stances are. You can get multiple Stances from one map, if you want. Also, thanks for pointing out which ones you got where. I've been trying to create a list of which ones you can potentially get on each map, but since you can only get each Stance once per save file the process is... well, not fun, anyway... been relying on comments like yours to figure 'em out instead.